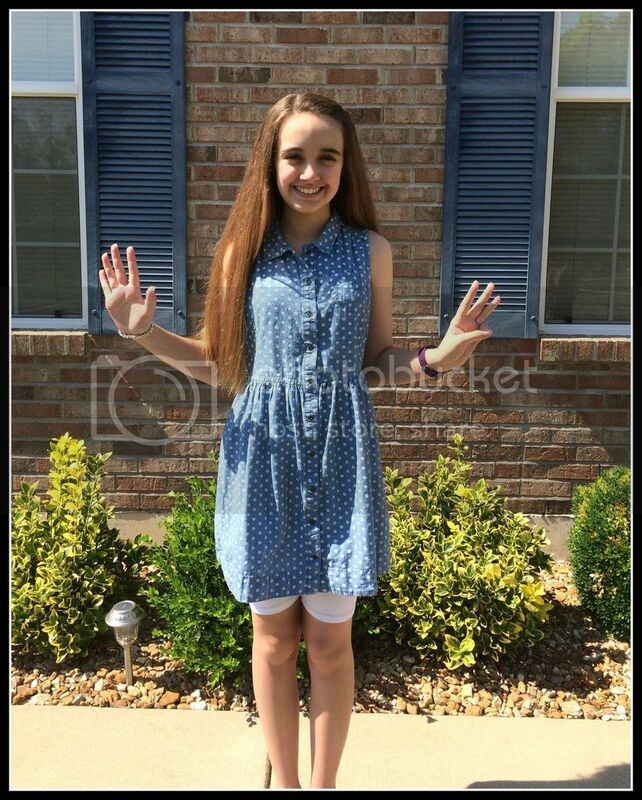 She's officially an eighth grader! Let me tell you, she's also one proud girl. Amber has been waiting since kindergarten to be one of the "big kids." 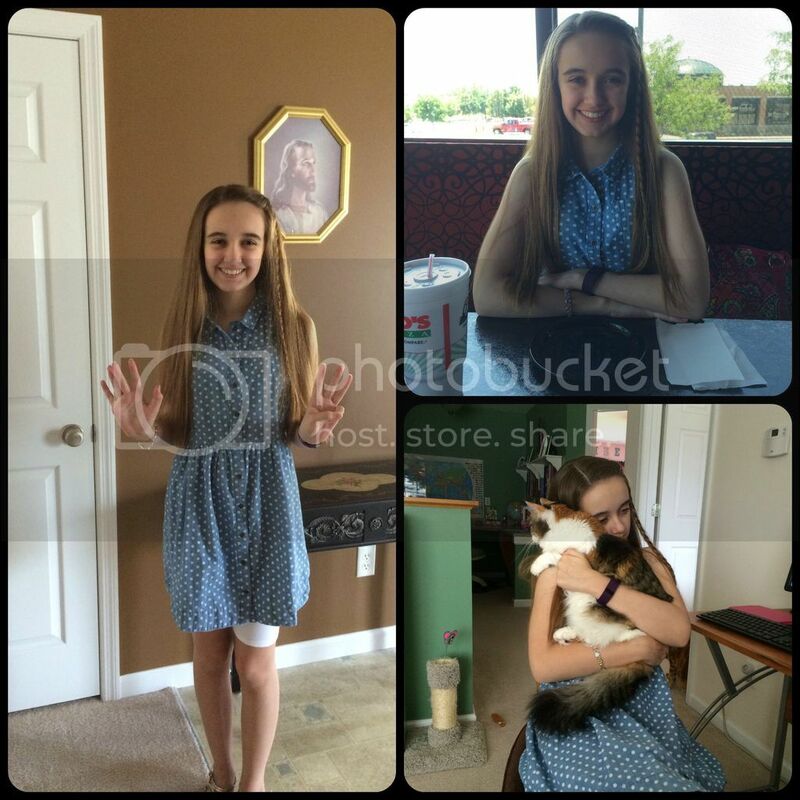 It doesn't matter to her that she's homeschooled; she's finally an eighth grader. We had a fun filled first day of school and then met Fred for a nice dinner for our 19th anniversary. All in all it was a lovely day. Amber and I went through all of our normal first day rituals, including lunch at a local pizza place with gluten free and garlic free food. We ran a quick errand to the store and even found jeans for us both. Of course there were a few pictures and discussions about the goals for the year. Actual school lessons were scarce on Monday, but we did spend about an hour with our Answers in Genesis Bible study, which is fantastic. Fallacy Detective has also been a huge hit with Amber completing her daily lessons without my knowledge a couple of times. As a side note, I really love that Amber has access to her scheduled assignments through Homeschool Tracker Online. It's saving me so much printing and time. The rest of the week was mostly half days, but we knew in advance this would not be a perfect week. At least we did manage a couple of school things each day. Amber had a friend, who's leaving for an extended vacation, over to watch Descendants on Tuesday, she had the GI doctor with X-rays on Thursday, Wednesday was a sickly day for us both, and we're hoping today is productive. Last weekend the three of us worked to transform Amber's playroom into something a bit more appropriate for a teenager. The American Girl dolls, Barbies, legions of stuffed animals, and My Little Pony figures all still have homes in the playroom. The LEGO table remains as well, but many other toys were either packed away in the basement or reorganized in the playroom closet. Amber now is the proud owner of our 15 year old couch in her new and improved hangout room - or whatever it is that we are calling that place now. 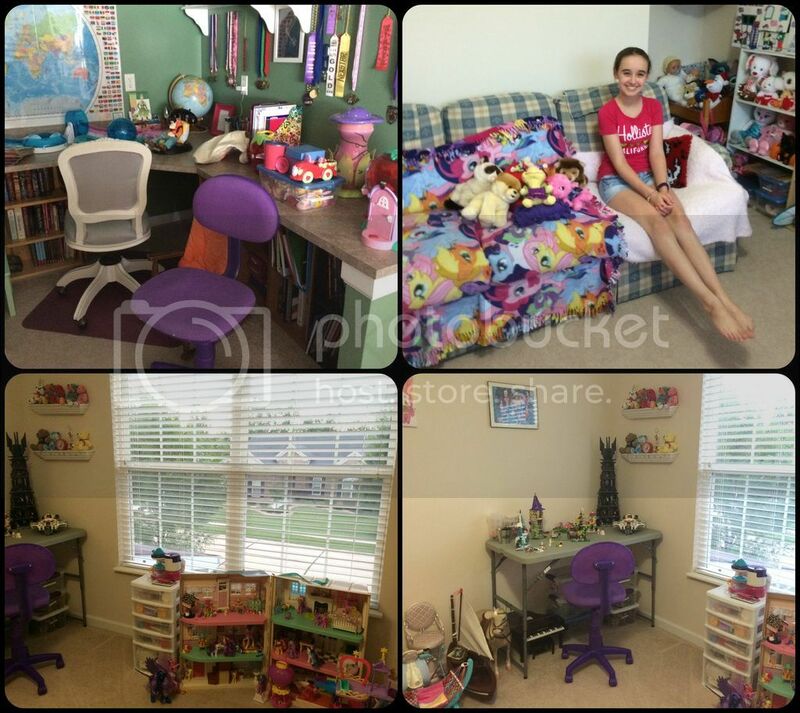 Amber's desk area was conveniently located for stuff coming out of the playroom. Unfortunately, it was two days before school started. But the new and improved teenage playroom (whatever it's name is now) has been a huge hit. She's also had the TV from my room in there on the floor for the majority of this week. She doesn't have satellite TV in the playroom, but she does have use of the Amazon Fire TV Stick which is almost as good since the Disney Channel app works through it. I really like her new playroom setup too. It makes it easier on sick days for Amber to relax somewhere besides her bedroom. She can relax in there without having to take the stairs. I'm sure we will acquire a TV designed for that room eventually, but not until there is a place for it other than the floor. We had a great visit with the GI doctor, except that she was running 55 minutes late, after asking us to arrive early for our appointment. Sigh. It was that kind of day (same day as dinner failure for me). Amber's intestines might be the healthiest part of her right now. GI feels the dysphagia is probably due to the EDS, however with the family history of reflux and schatzki's ring, it's possible Amber is developing a schatzki's ring and feels it before they can visualize it. We have to keep the doctor updated and unless it goes away in the next month, Amber will have some followup testing to ensure nothing new is developing in her esophagus. More doctor visits. This time to GI. And a failed dinner at McAlister's - she really enjoyed her salad and was being silly to cheer me up. My dinner never actually came. So they ate, but I didn't. I can't recommend this location of McAlister's as they often have problems of this nature. 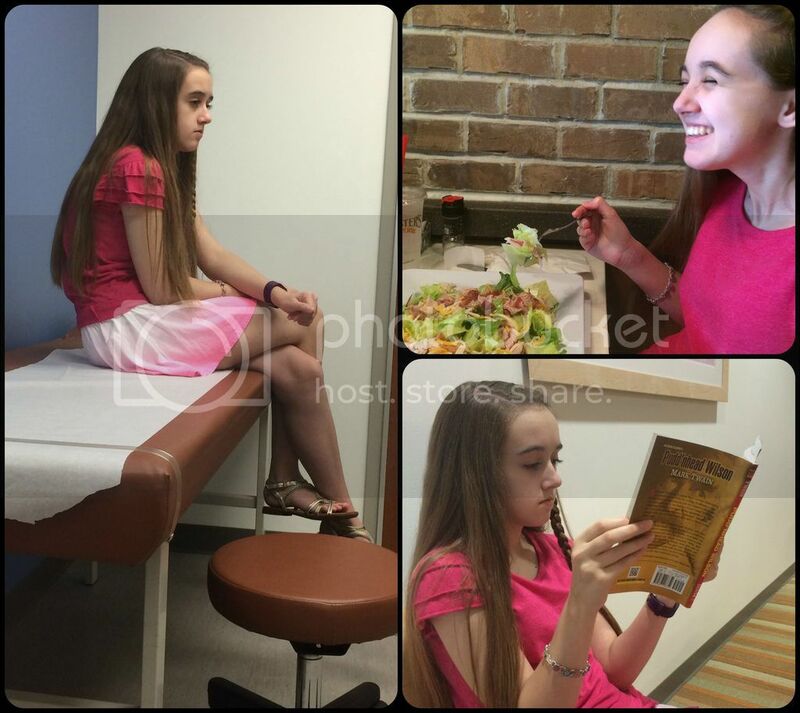 Amber has been experiencing rib subluxations all week, even one with the GI doctor present. It was recommended we try to get her into therapy now to strengthen whatever muscles we can to help her joints. As the GI doctor said, "She's the real deal. Her EDS appears quite serious." Of course it does. I did call rheumatology back to see if they can manage the EDS for a few months (or 10) until the genetics appointment. Amber's attending rheumatologist was unavailable, but the fellow (fellowship doctor) I talked with is setting up a physical therapy evaluation with Washington University rheumatology (an hour away... we live on the outskirts of the metro area) who will hopefully design a plan that a closer therapy location can implement. I always find it so weird working with research and teaching hospitals. You never know exactly who your doctor might be. Next week we begin our water aerobics classes, sorta. I switched our registration to their "Water Aerobics Card" so we can attend any water exercise class and not need to stay with one set class time. We also have a field trip planned to see the reproduction Nina and Pinta ships. Of course, I'm hoping to accomplish a good deal more book work too, but I'm always hoping for that. Co-op starts in three weeks and I need to make the most of our time prior. I hope you have a good experience with a teaching hospital. We have had great success with them through the years. They often have more cutting edge technology. I love all of Amber's smiles. She is a real trooper. We've used the research and teaching hospital for Fred, but Amber's doctors weren't there in the past. The pediatrician is now affiliated with that hospital and it's really the best in the area for anything genetic. She has such a beautiful spirit. Love her smile. She's grown through this summer. I'm checking in from from Weekly Wrap up! She has grown up this summer. She's officially a smidge taller than me. I'm not thrilled being the shortest anymore! We are giving Homeschool Tracker Online a try this year. I bought the kids Fallacy Detective last year and they quite enjoyed it. Happy Anniversary. I hope you like Homeschool Tracker Online. We loved the desktop version, and I'm still getting used to the online version. Amber loves having access to the assignments without printing or getting onto my computer. It is more convenient in that respect. Amber does look so beautiful and happy despite all that she goes through. Her first day of school outfit is adorable! I'm sorry you keep getting bad news from doctors. I hope they can all come up with treatment plans that help Amber feel her best. I am going to have to look up schatzki ring. I'm waiting for the therapy order to come. Then we might make some additional progress. We are maxed out on what the heart medications can do and need something for the joints at this point.